Superdry women’s Vintage Logo Carnival sequin hoodie. Add some glitz to your hoodie collection this season with the carnival sequin hoodie. This high quality hoodie is a comfort essential this season, designed with a super soft brushed cotton lining and ribbed trims for a flattering fit. 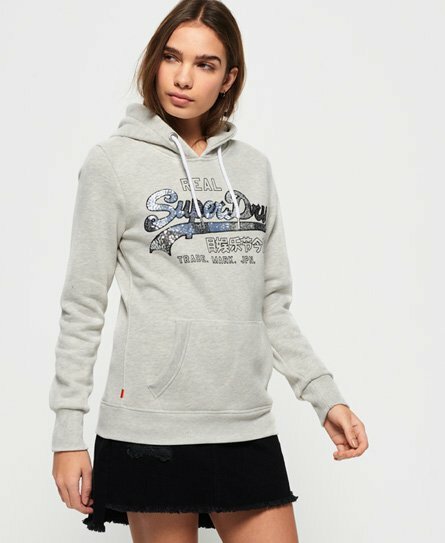 This hoodie has the ionic Superdry logo across the chest, embellished with dazzling sequins and an adjustable draw cord hood. In addition, the Carnival hoodie also has a large front pocket and a Superdry tab in the side seam for a premium finish. For a key look this season, partner this hoodie with your favourite jeans and trainers for a stylish, yet comfy outfit.